It smelled like burned rubber: no engines roaring, but wheels screeching. And after the group of vehicles disappeared behind the next turn, everything went quiet again until the regenerative electric engines and screeching slicks forebode the fast-approaching race cars once again. FIA’s eighth round of the Formula E Championship held on May 21, 2016 in Berlin was anything but boring. Around 15,000 people could experience that for themselves on a sunny and warm spring day and later cheer Daniel Abt’s second-place finish on home turf. This season’s win at the sold-out BMW i Berlin ePrix was the third one in a row for Sébastien Buemi and his Renault team e.dams. It was indeed thrilling to watch: The repurposed Karl-Marx-Allee in the midst of Germany’s capital offered everything what a good car race needs, from burning rubber, risky overtaking maneuvers, accidents sending car parts flying, and, of course, a champagne shower – but no deafening engine roar, which seemingly wasn’t missed by the audience. Drivers naturally pushed forward the first chance (or chicane) they got, which was when teammates Nelson Piquet Jr. and Oliver Turvey razed a front wing off each other’s car and Buemi moved into the lead after starting second. Jean-Éric Vergne, who began the race in pole position, was able to counter with a surprise maneuver, but few laps later, the Swiss national in his Renault Z.E.15 again took the lead and defended his position up until the finish line. Vergne ultimately placed fifth. 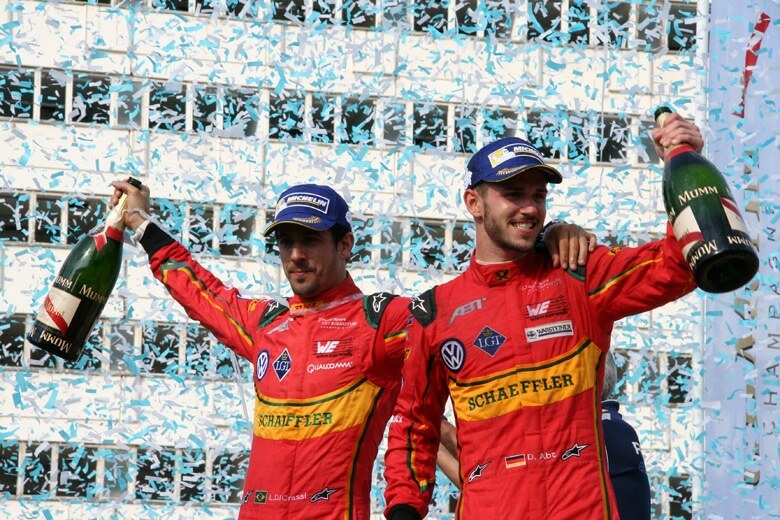 During the entire race, there was a thrilling competition for the second, third and fourth place between Daniel Abt, Nicolas Prost and Lucas di Grassi, the Brazilian national who had started as eighth and partly succeeded by moving ahead of Prost to become third after several failed attacks (see figure 3, p. 3). Shortly thereafter, drivers were instructed to run safety car laps because of a vehicle that broke down on the track. Despite Abt being given a team order (“Let Lucas by“), di Grassi wasn’t able to overtake him in the end, which meant that the Brazilian is now leading the overall ranking by only one point. Abt said after the race that he had given his teammate a sign to race past him two laps before the end, but admitted that he had not wanted to risk his place on the podium, as Nicolas Prost, also from Renault e.dams, was breathing down his neck. Despite the quarrels, Abt was all smiles during the podium celebration in front of a home audience. Who will win the world championship this second Formula E season will now be decided in the final two days of racing on July 2 and 3, 2016, in the Battersea Park in London, UK. After eight races, Abt places seventh in the driver ranking (50) and Nick Heidfeld ninth (47). In the team ranking, Renault e.dams is currently in the lead with 202 points before ABT Schaeffler (191 points). There won’t be a race in Moscow, as originally scheduled for the beginning of June 2016. Instead, the organizers are turning to fans for ideas which racetrack in New Delhi could be suitable for next season. 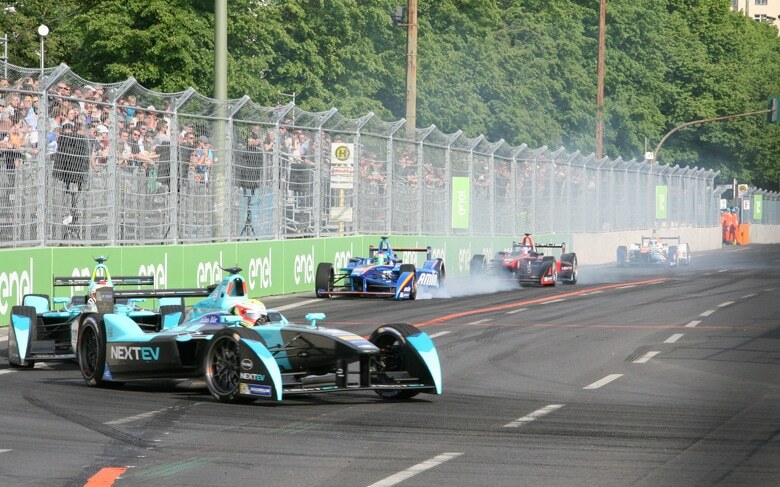 Each Formula E team has two drivers in the race, who both have two vehicles available. Instead of refueling the cars during the race, as it is done in Formula One, the Formula E drivers just get into their second car with a fully charged battery (28 kWh). 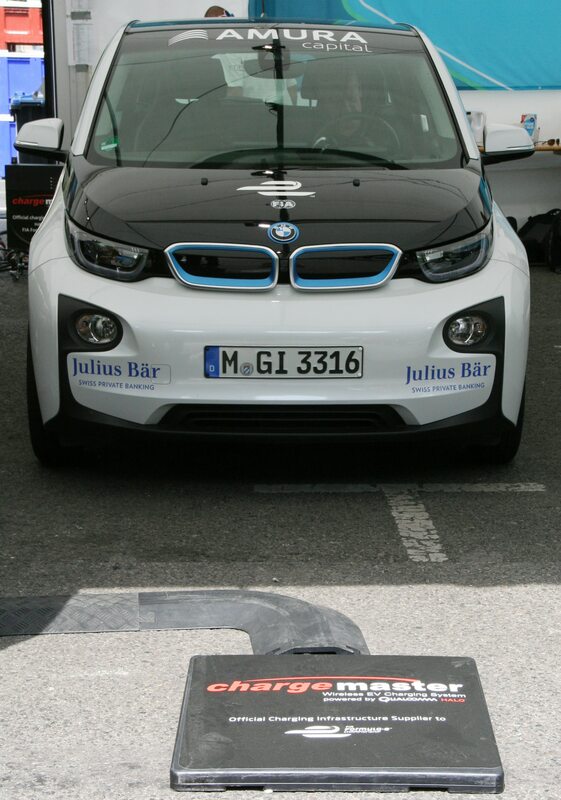 Their vehicle’s output is 170 kW during the race and 200 KW during qualifying, which is ensured by its control unit. This unit also regulates the FanBoost, which gives the three “most popular” drivers temporary access to 200 kW during the second half of the event. Additionally, the car swap halfway through provides them with better opportunities for individual strategies and offers the audience a more fulfilling racetrack experience. During the first season, all drivers started in identical cars, but the current one at least allowed for individual powertrain designs, prompting already seven manufacturers to develop their own solutions for engine, inverter and transmission. It is the reason why almost all teams have meanwhile switched to multispeed (two- to five-speed) vehicles. For example, the team of ABT Schaeffler Audi Sport has designed a three-speed electric engine. Only DS Virgin Racing and NextEV TCR rely on two one-speed electric units – one per rear wheel. Although developers of electric cars typically refrain from installing gearboxes, quickly shifting speed is said to provide even greater performance during the ePrix. It is why Formula E cars accelerate from 0 to 100 kph in 2.9 seconds and reach 225 kph on straight parts of the 1,927 kilometer long racetrack. Starting next year, developers will have even more freedom in designing their vehicles, which will lead to even greater competition – and possibly, also more teams and more drivers. The required electricity is fed into the lithium-ion batteries by using a charging plug. Only the two BMW i3 vehicles, which stand by as medical cars, as well as the two BMW i8, which are safety cars, use inductive charging, so that they’re ready to go at any time.